What if Heaven wasn't just something we thought was hidden on a cloud, but was actually revealed on a cross, in the unlikely package of an empty grave? And what if Heaven was something that wasn't coming lateror coming soon, but is already here, now! What if Heaven is actually "Here On Earth"? 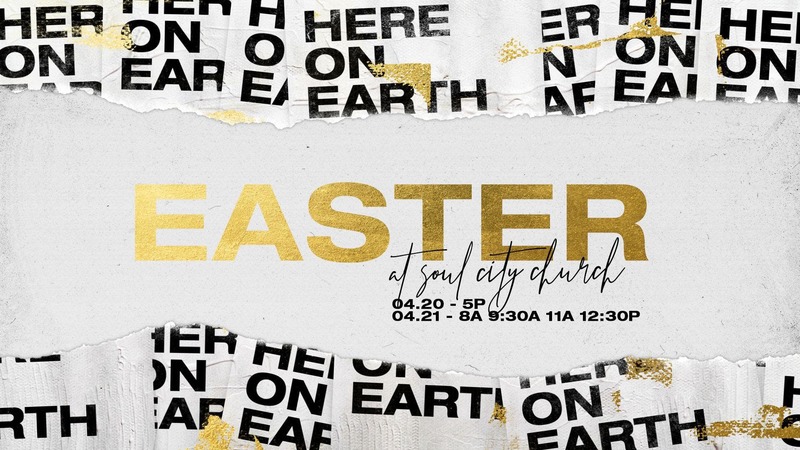 Please join us for a our Soul City Church EASTER PREVIEW GATHERING - "Here On Earth" on Thurs. April. 18th @ 7:00p. We know that many of our friends and family are serving during our Easter Gatherings or leave town for the Easter holiday, and we would love to invite you to join us on this night as we celebrate our risen savior togehter.